This album is not an idiosyncratic whim dreamed up over a few "jars" at the local pub, but brings to light an aspect of Tony Christie the artist (real name: Anthony Fitzgerald) that many won't have expected. The songs have profited immensely from the contemporary arrangements, making the "golden oldies" shine with a new brilliance. Various successful albums tipped the vote away from naming the production Simply in Love with Irish Music or alternatively Made in Northeim. Quite deservedly, this album has been called The Great Irish Songbook — the current album of the "Great Irish Singer" Tony Christie. 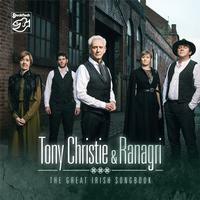 With this SACD Tony Christie traces his family roots, which are very definitely in Ireland (not Amarillo). Like many of his generation, his great-grandfather went over to England looking for work. The legacy he left behind was a button accordion on the living-room cupboard and the songs of Ireland in the hearts of his family. This is really Tony Christie's masterful musical homage to his heritage and his ancestors. For his fans and all other interested parties this album is a very gratifying and uplifting journey to the mysteries of the Irish-Celtic music culture — modern and in excellent sound quality.